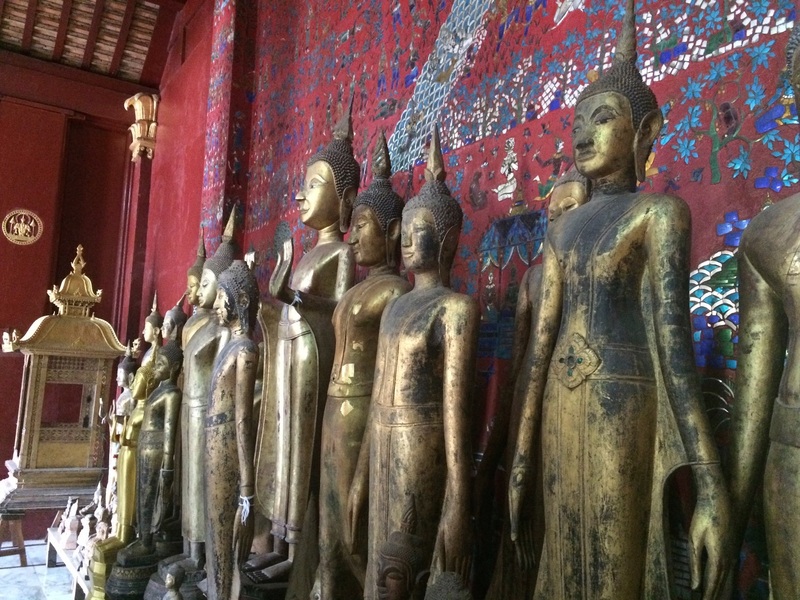 Buddhas at Wat Xieng Thong. One will find at least thirty Buddhist temples on the narrow peninsula that is Luang Prabang. Though we’ve not visited all of them, the combined energy they create is always present. A day doesn’t not dawn without the centuries old alms walk taking its quiet and measured steps through the main street. Soft gongs and chanting monks begin each day, calling from temple to temple, a gentle way to emerge from sleep. 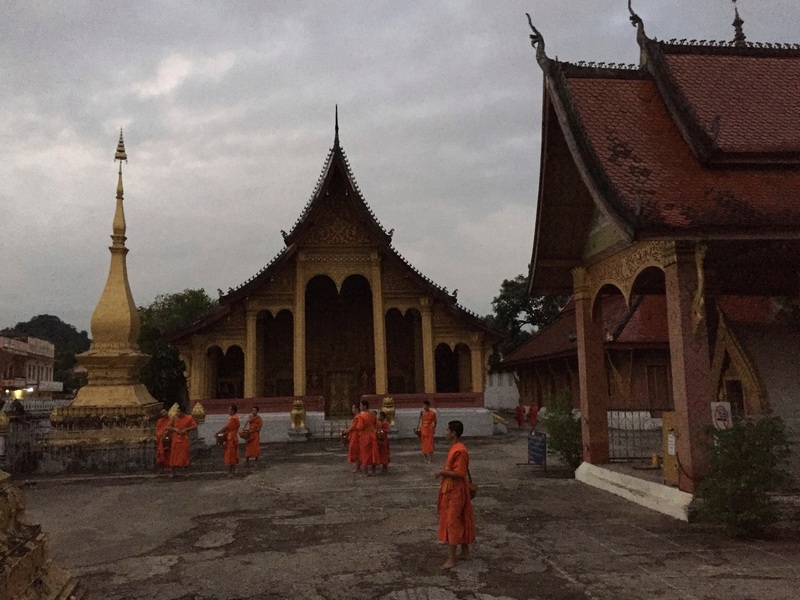 Monks gathering in the early morning before the alms ceremony. 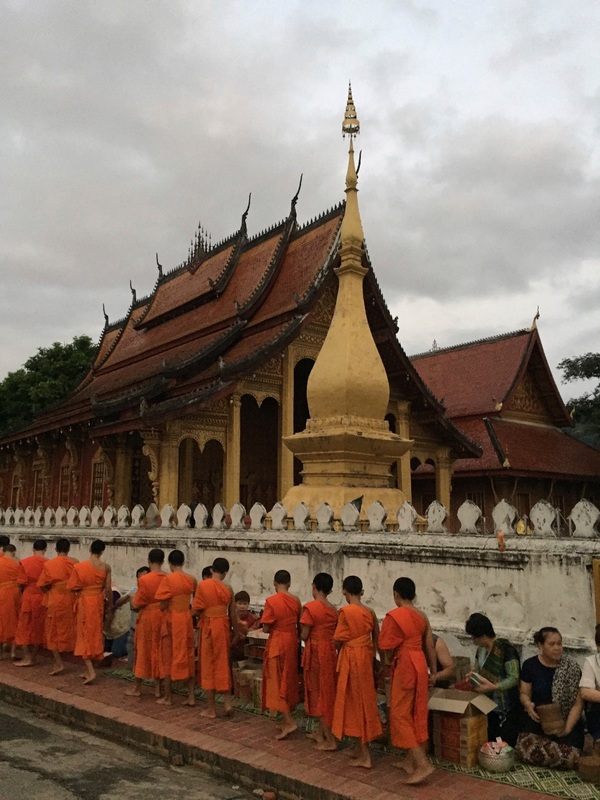 During the early dawn alms ceremony, monks file in silence through the streets of Luang Prabang every morning of the year. The Festival of Lights struck us as a celebration with similarities to Christmas in the West. This is one of the great weeks of the Lao calendar. 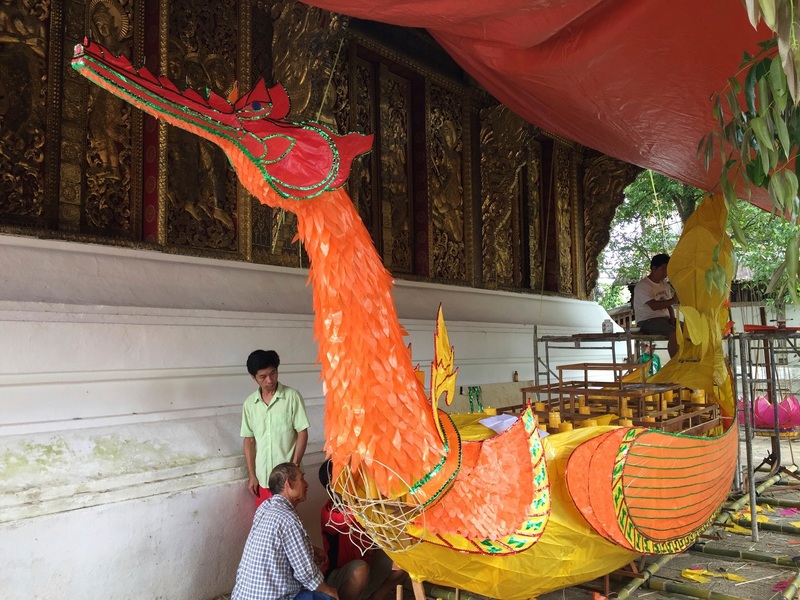 Decorations abound, each temple and nearby village construct a ceremonial dragon float that will be paraded down the main street to Wat Xieng Thong, judged and then burned on the Mekong River in a bonfire ceremony of non-attachment. All that work goes up in smoke releasing of earthly desire. A Naga float in production. A community project every year for the Festival of Lights. People and monks join together. Beautiful draping adorns this float. 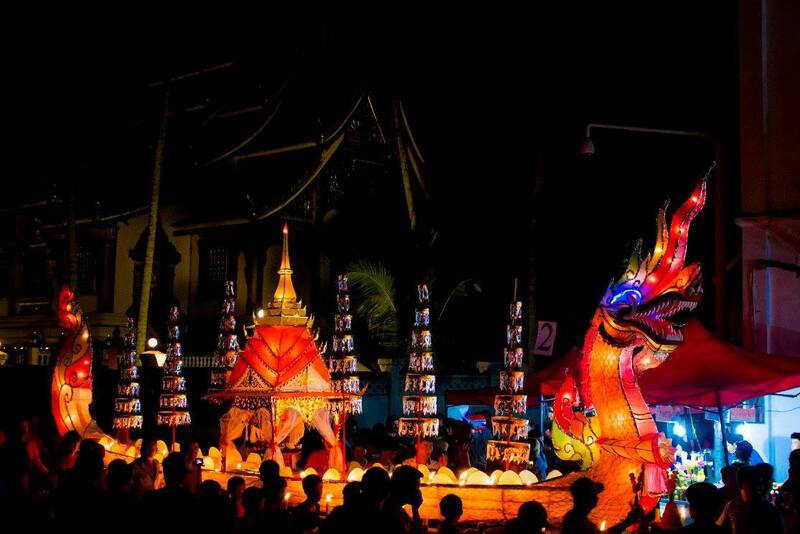 An annual renewal in Luang Prabang dominates the Festival of Lights. 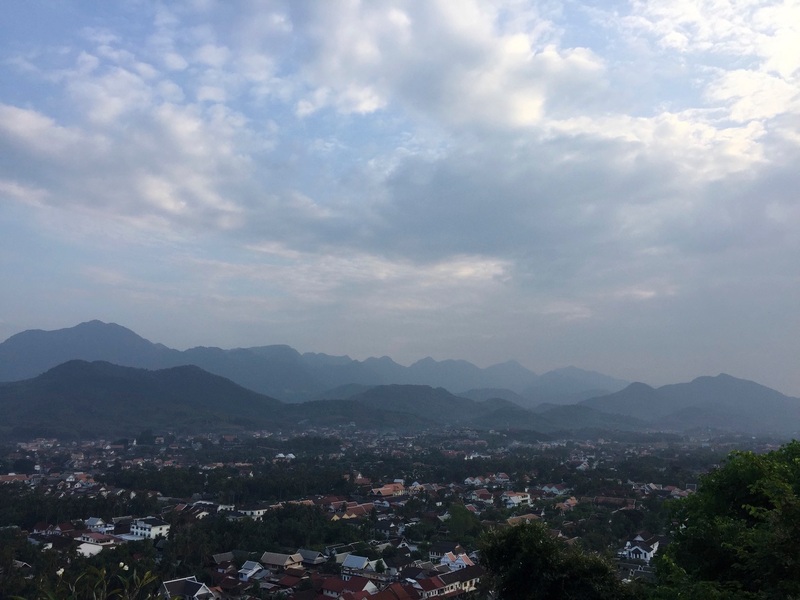 The day before the Festival of Lights we climbed Mount Phou Si, which towers over Luang Prabang’s Night Market and National Museum. The legend of the mountain’s origin reveals a lot about this part of the world. 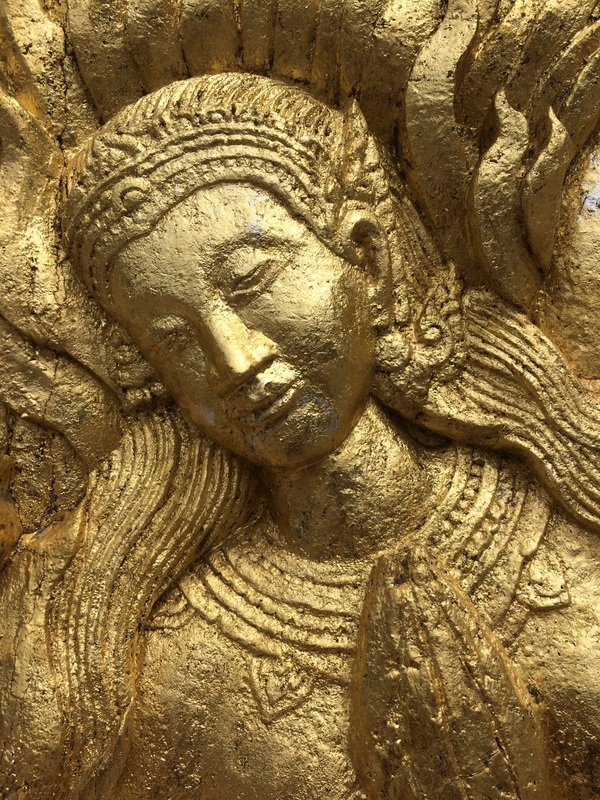 To learn about this narrative from the ancient Kingdom of Lang Xan, it helps to seek out Laotian story tellers, who are easy to find in Luang Prabang. 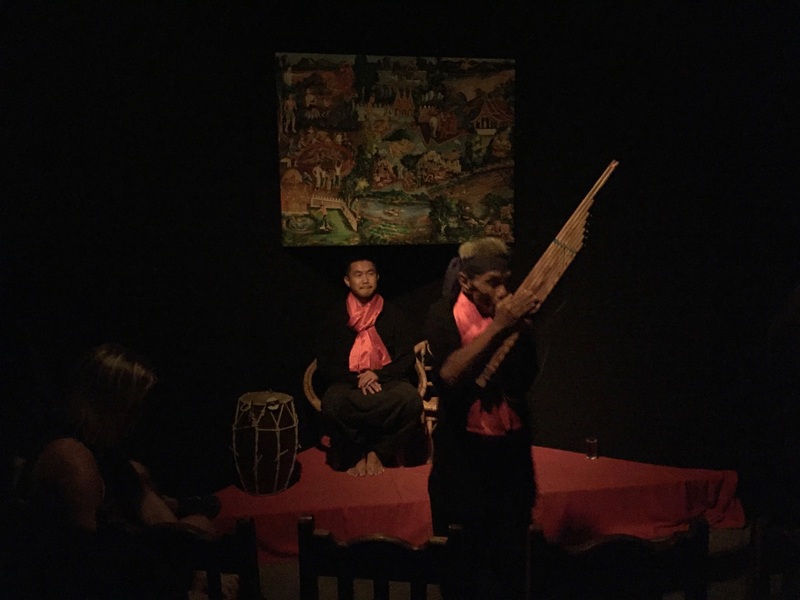 Story tellers are a major part of Lao culture. What animates our fascination for much of Southeast Asia is the junction of Buddhist and Hindu thought represented in Theravada Buddhism. It’s similar to the Old Testament being part of the New Testament in Christianity, where there is an overlap between Judaism and Christianity. In Southeast Asia, one finds the Hindu Ramayana story dominating Buddhism. 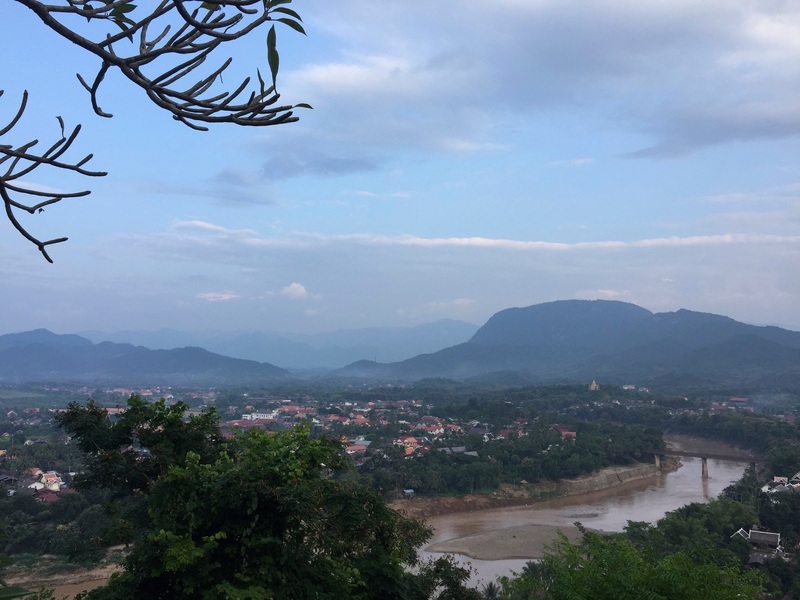 And a charming story plays out, and frankly defines, the city of Luang Prabang. According to the legends of the ancient Lan Xan Kingdom, Princess Sita, the wife of Rama who is abducted by the evil Rakshasa of Sri Lanka and saved by an alliance forged by Rama with the Monkey God Hanuman, resides in Luang Prabang. Princess Sita developed an appetite, so goes the Luang Prabang legend, for delicious mushrooms. She beseeched Hanuman to bring her her favorite mycological delight for her meals. He flew on his monkey wings to Sri Lanka, came back, but she was not satisfied with his choice of mushrooms. He flew again, with the same result, and on and on as is the custom with great legends. Eventually Hanuman was exhausted and beside himself. A close up of Sita at Wat Xieng Thong. Why the complications? It seems Sita was in love with the delicious monkey mushroom, but being shy, did not want to offend the powerful Monkey God Hanuman by asking directly for her desired taste treat. She thought he would find her request rude. Hanuman’s solution? He lifted an entire mushroom mountain from Sri Lanka, and planted it in Luang Prabang, so that Sita could enjoy all the mushrooms she wanted without worrying about giving him offense. So that explains the name Mount Phou Si (Si is Sita). The story is a fantastically apt metaphor for communication throughout Asia. Being direct in address wanders close to barbarism, which you don’t want to learn here the hard way! 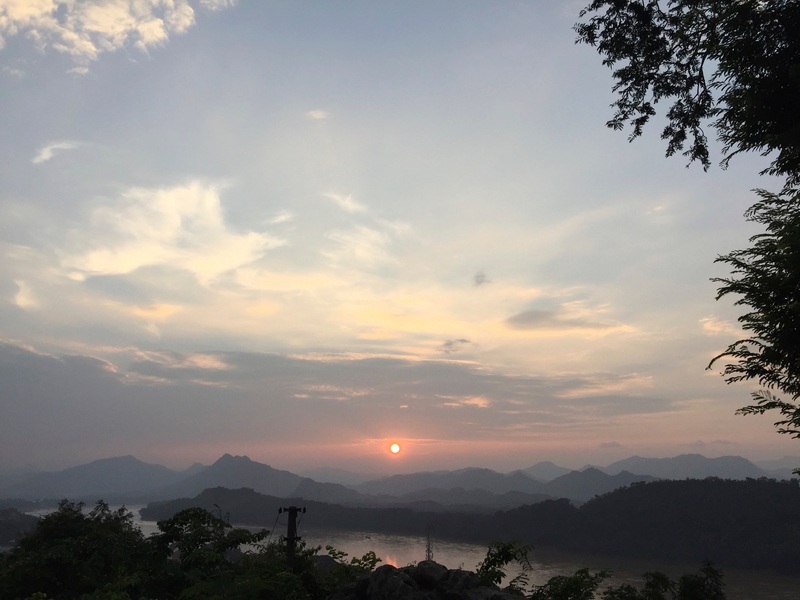 And so, I urge you to climb Mount Phou Si for sunset. 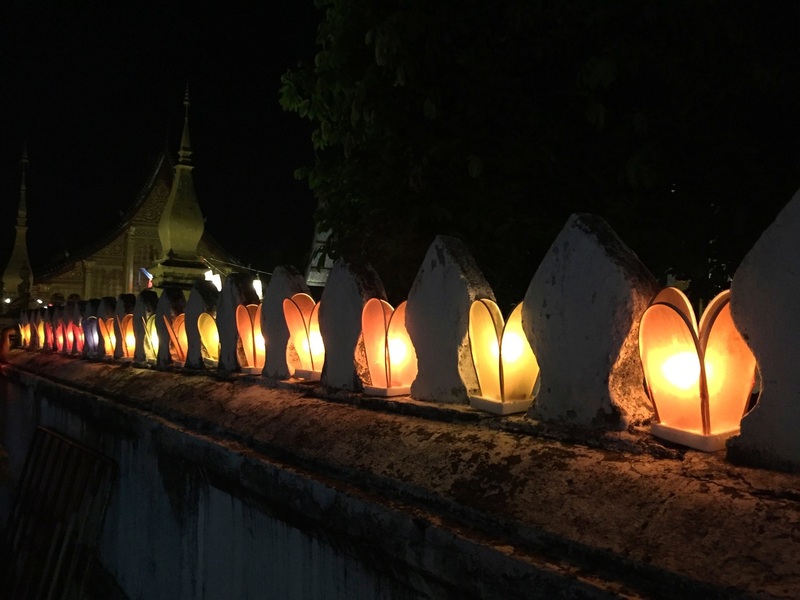 Hopefully your walk will be accompanied like ours was, with soft ancient Laotian music wafting up to our ears from the National Palace and Night Market areas! Climbing up the stairs to the top of Mt. Phou Si. A view of the Nam Khan River. Is this an Asian Salzburg? With an open window on top of Mt. 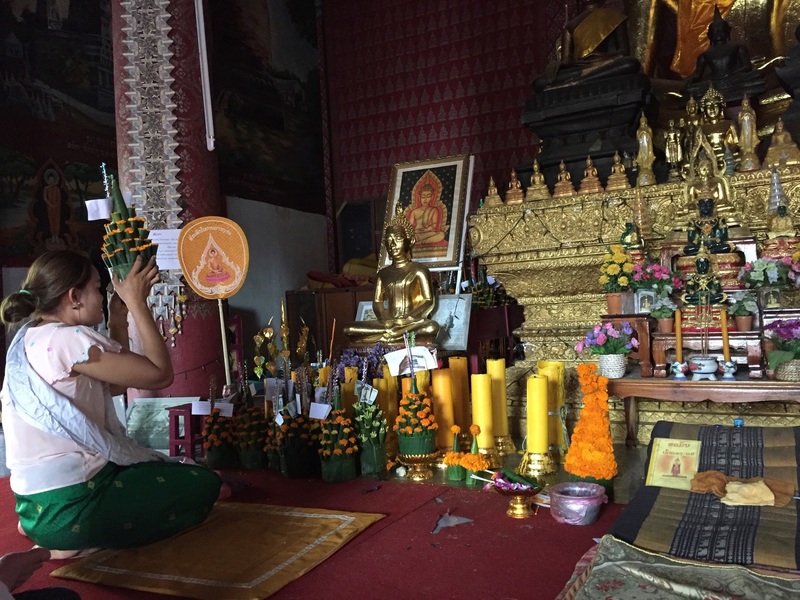 Phou Si, a woman asks Buddha for help with life’s challenge at Wat Chom Si. To the left on the top of the mountain. And sunset to the right, over the Mekong River. I am not the first person to be humbled by the kindness of the people of Laos. It is not possible for people to become more mellow about life, you’ll find the tempo of Luang Prabang slow, gentle and confident. In the West, we go to heaven or hell. In Luang Prabang, we’ll see you next time anyway! Accumulate good deeds in this life for the next one, which is born out everyday early in the morning with quiet the alms procession. A young woman and her offering on the morning of the festival. The atmosphere of any city preparing for its major holiday is always exciting. 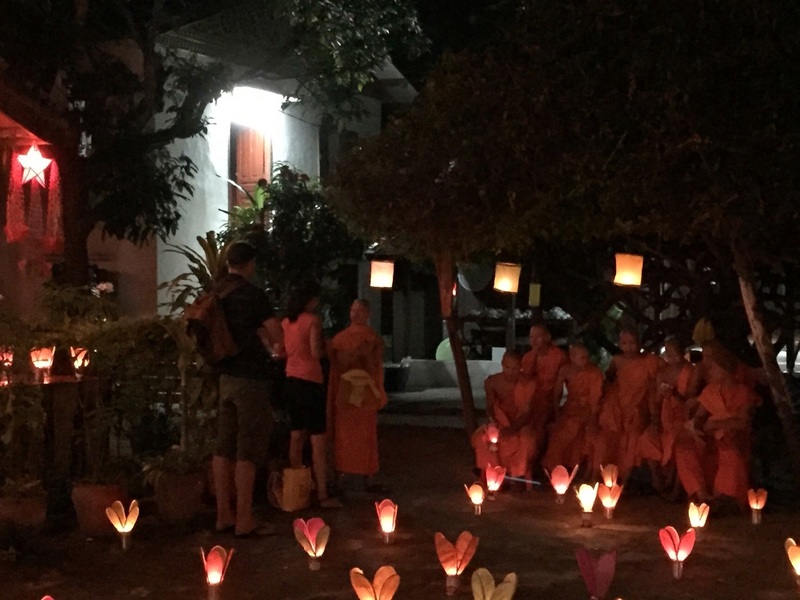 But I have never, ever, experienced an entire night of loud drumming in order to purge the world of evil spirit as occurred in Luang Prabang on the eve of the Festival of Lights! We certainly woke up in a haze on the next morning, going in and out of consciousness because of the drumming. 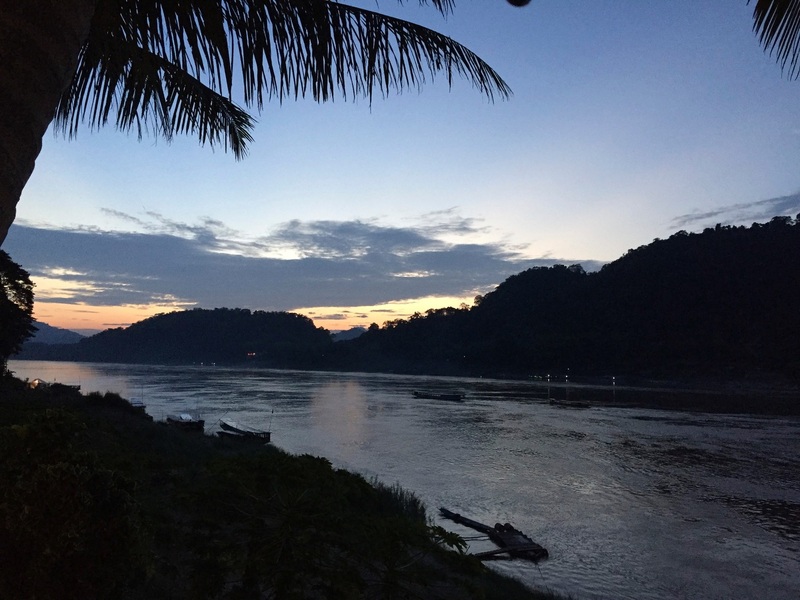 Once the drums stopped we knew that the sun had risen again, to a fresh purified world, at least in Luang Prabang. Jan and I then just walked and walked and walked from temple to temple, stopping in from time to time to observe people in their own quiet ways concentrating their dreams for the coming year. You could feel the community energy by just taking a breath. Absorbing the morning energy after a night of drumming at one of many temples, Jan feels that they’ve chased away evil. Because, as foreigners, you attract a different energy. 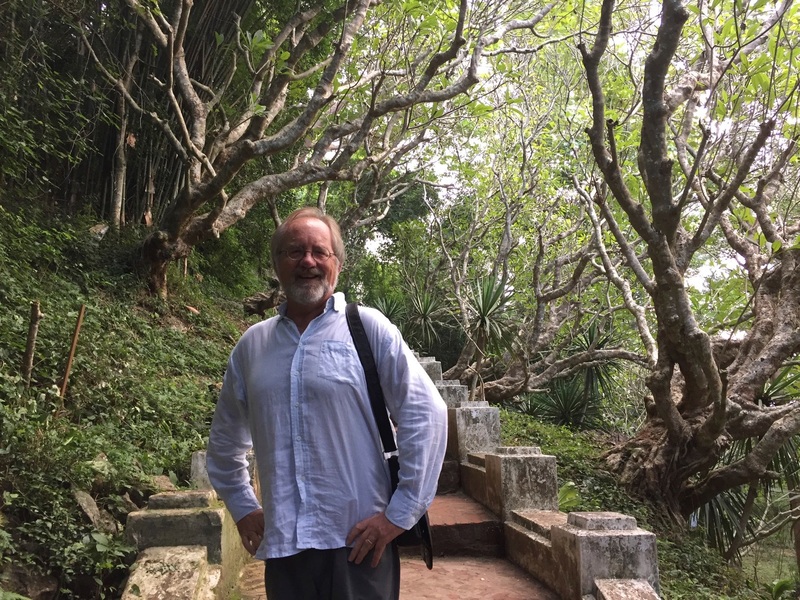 My great teacher about all things Southeast Asia, acupuncturist Loi Trinh Le, once told me that everyone you meet is someone you are supposed to meet. She use to say that one should think of a place on the globe you’ve never visited. For her devout Buddhism, those places meant you weren’t meant to know those people. But when you do meet someone, from a line at a grocery store to an airplane flight to an audience member to a neighbor next door to a visit to a foreign country, somehow, you’ve met soulmates from a past or future life. The young woman in the earlier photo seemed to understand what Loi Trinh Le had taught me, and was quite happy that I wanted her photo. Luang Prabang is a place of spiritual energy. 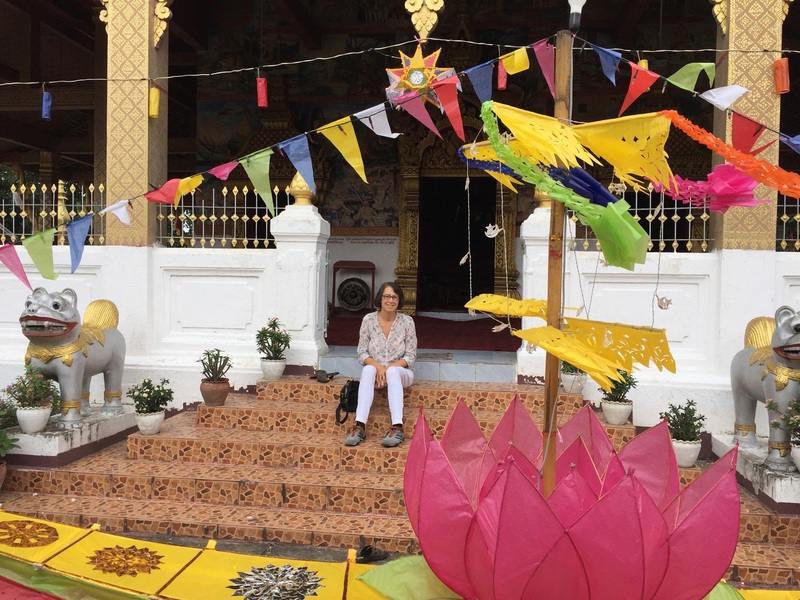 And in another example of the energy of the place, Jan and I were overwhelmed during this second visit to Luang Prabang. We were treated like rock stars because of the visit of President Barack Obama! The paper shop where Obama shopped for his daughters. I’ve a whole bunch of new Facebook friends in Luang Prabang, that’s for sure! And as an inspiring example of the Laotians creating light out of darkness, when Obama visited Wat Xieng Thong, he was asked to strike the largest ceremonial gong nine times, nine being the number of infinity. Why? Just good manners from a visiting head of state? 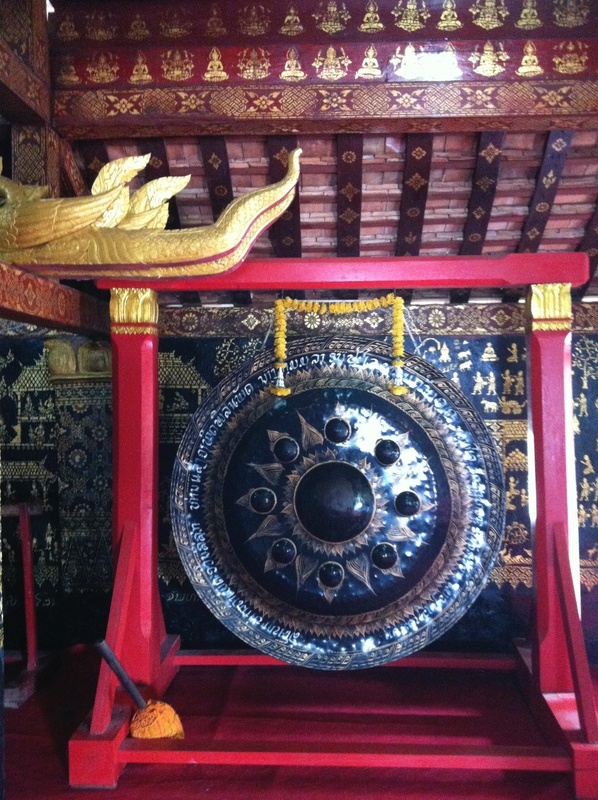 The Wat Xieng Thong gong struck by President Obama. Because President Obama had come to Laos to disperse the shadows from the horror of 9 years of American bombing, a threatening reality of American exceptionalism that exemplifies the complex burden of history my country bears in Southeast Asia. Yes, he announced a significant increase in funding to clear Laos of UXO (unexplored ordnance). But his reception was so strong, so positive, that just being Americans a few months later in Luang Prabang became a humbling memory for me and Jan. The Lao can teach the whole world about how to transform negative energy, how to release revenge and hatred so you can move forward. The Mekong River seems to holds deep waters for us all. In a new era that will be marked by considerable political activism, we Americans must not let this new diplomatic beginning in Southeast Asia fade away into regressive isolation. I know I’m all in with President Obama, who plans to devote considerable time to young leadership in this part of the world after his term in office expires. National service, anyone? 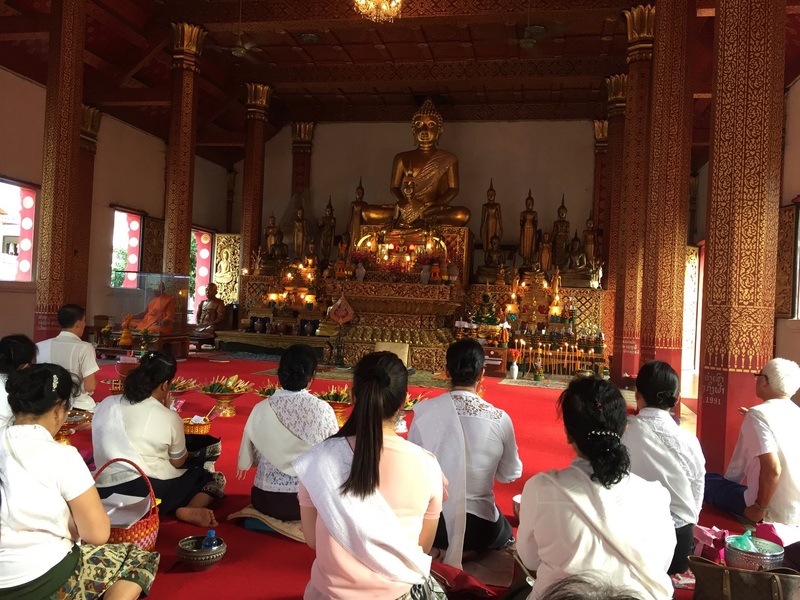 Because for Laotians to have such pure hearts towards us as Americans is the stuff of tears, of past regret, present hope and future action, and I feel obligated to share this experience with my many blog readers all over the world. Southeast Asia teaches one to reconcile and accept contradictions, at least that’s what I’ve learned over the years. And one of the reasons we keep returning. I need now to honestly provide difficult statistics that represent the necessity of continued activism. We should not indulge historical memory loss. From 1964 to 1973, the U.S. dropped more than 2 million tons of ordnance on Laos during 580,000 bombing missions – equal to a plane load of bombs every 8 minutes, 24 hours a day for 9 years – making Laos the most heavily bombed country per capita in history, a brutal statistic worthy of the mythical Col. Kurtz. Up to 1/3 of those 2 million tons did not detonate, resulting in years upon years of tragedy to families and innocent citizens. In 10 days of bombing the U.S. spent 130 million dollars. That’s more than it has spent in 24 years in cleanup combined. 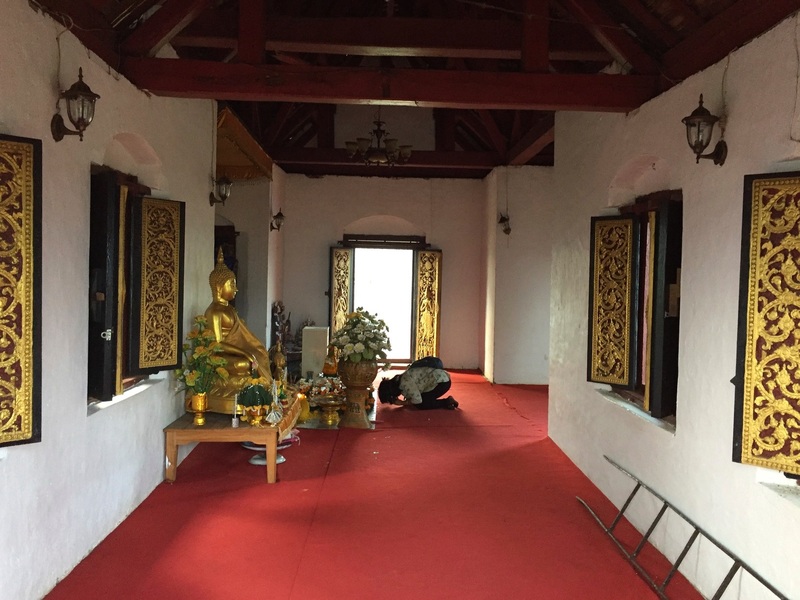 After President Obama struck the largest deepest gong at Wat Xieng Thong, the Lao sealed the room for a significant period of time, in order to preserve his positive energy. And new actions for a better world. A young woman rubs a secondary gong for positive energy on the morning of the Festival of Lights, in the same room where Obama struck a gong 9 times, symbolizing numerical infinity. And as you can see from the preceding photo, his vortex of peaceful energy is taken very seriously by the people of Luang Prabang. Which also means, for this post, that the Festival of Lights is upon us! Let’s create light out of darkness, hope out of fear. I will let a brief photo gallery give you an idea of the unforgettable experience. Women chanting and praying at twilight at Wat Nong Sikhounmuang. 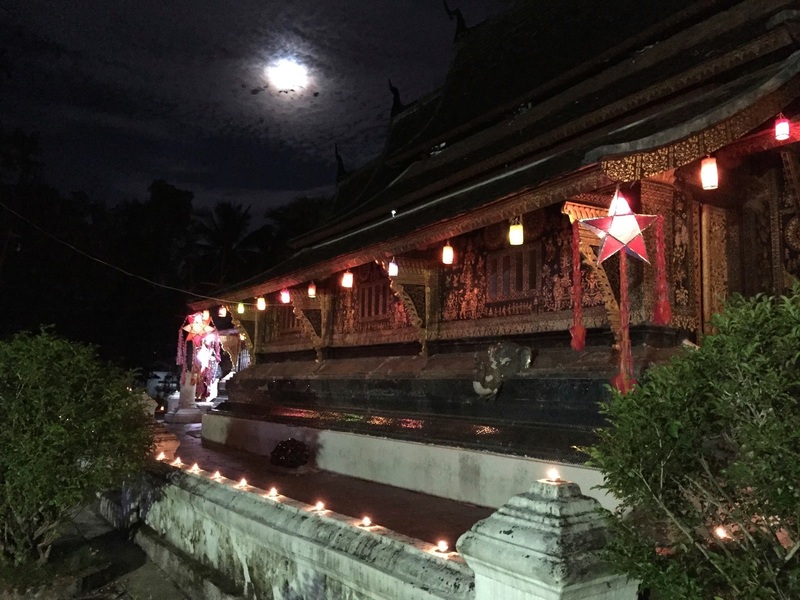 The clouds shroud a full moon at Wat Xieng Thong. People and monks talking together. Lanterns on a temple wall as we walk from temple to temple. 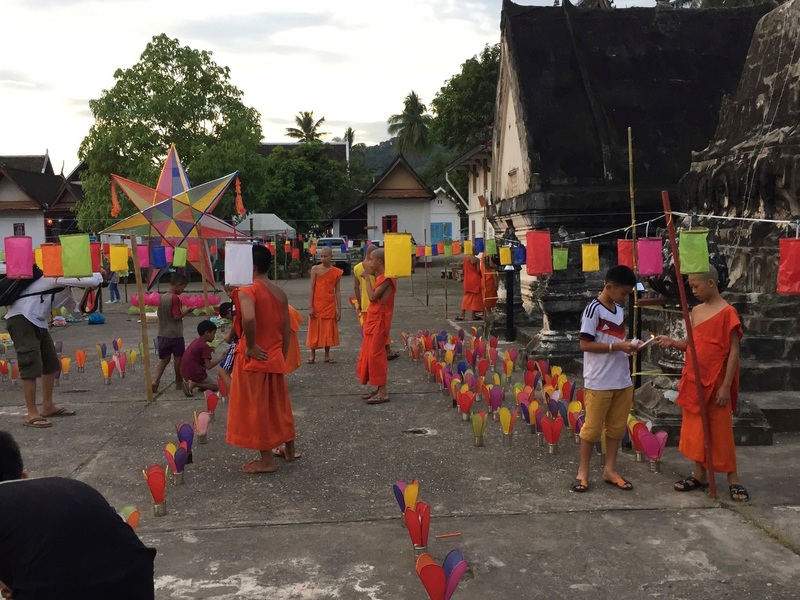 Lanterns are prepared at over 30 temples in Luang Prabang. 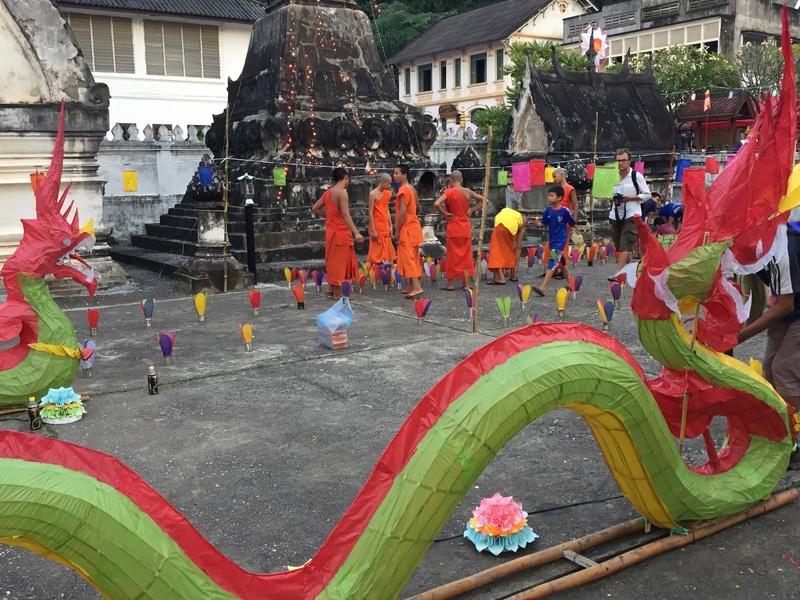 As the evening progresses, the protecting naga floats are paraded down the main street of Luang Prabang. 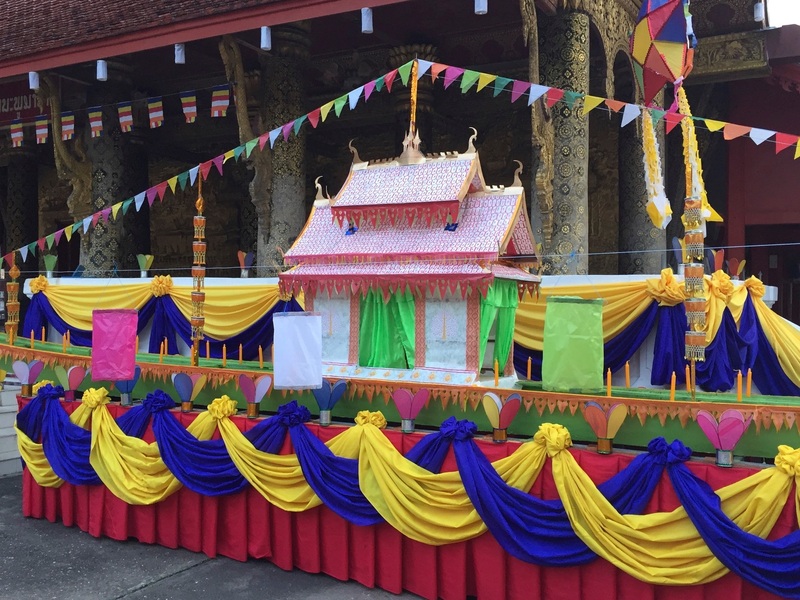 They are all headed to Wat Xieng Thong, where they will be judged for presentation (since I live in Pasadena, think awards for Rose Parade floats). 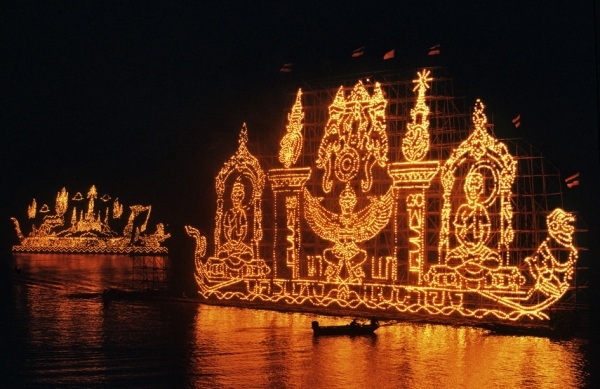 And then they are floated on the Mekong River and burned, a dramatic symbol of non attachment to material things on earth. 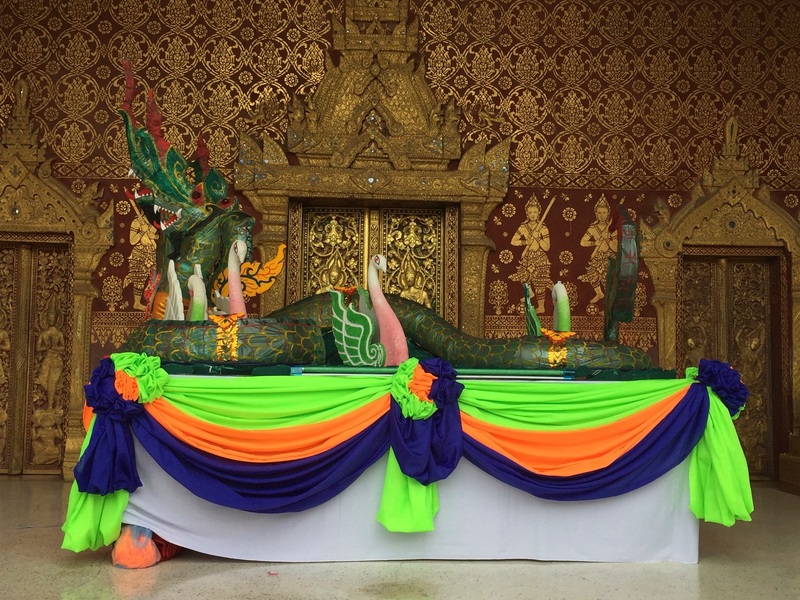 The naga floats on their way to Wat Xieng Thong. Floats on the Mekong River. 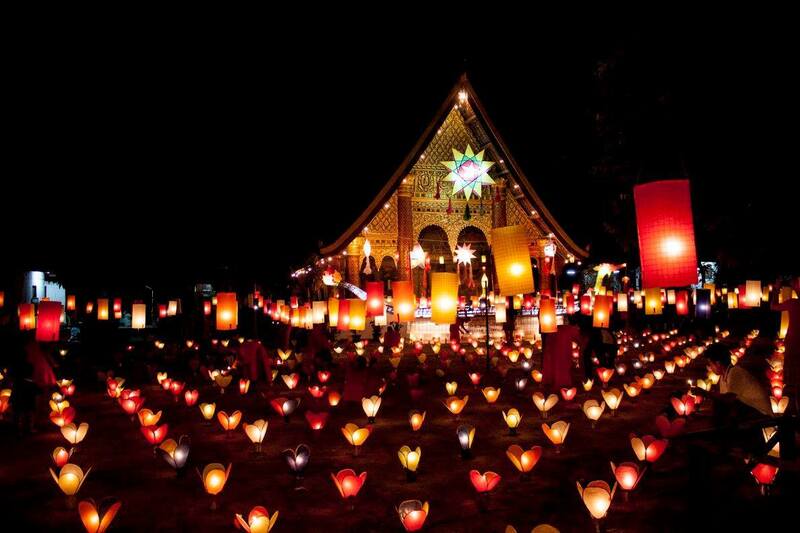 And then, the most amazing moment of all occurs, a shared community transformation begins as the lanterns are lit. People release their lanterns into the night sky and all the prayers and good wishes sail up to heaven for peace and prosperity. A great way to send a message to your loved ones up in heaven. This is the best extra terrestrial post office possible! Lanterns floating into heaven during the Festival of Lights. 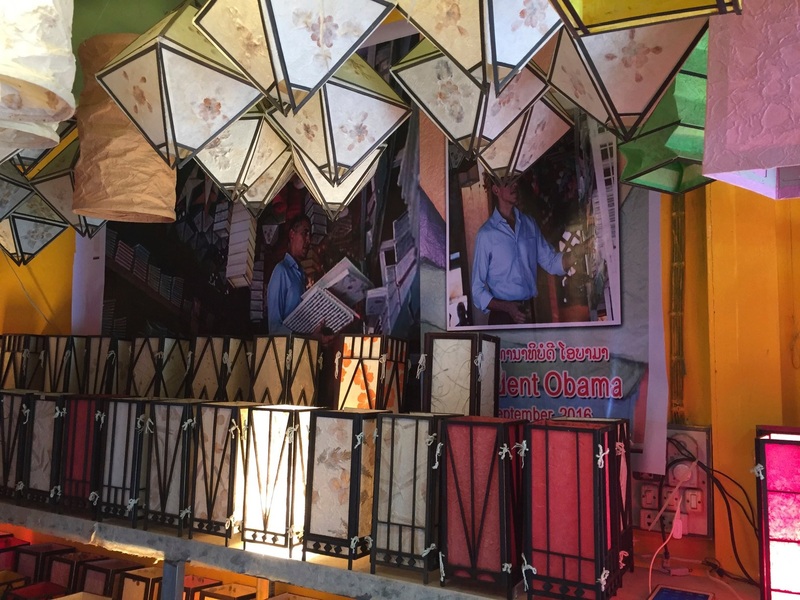 During his visit in Luang Prabang, President Obama wisely observed that for many years the United States viewed itself as so powerful that it had nothing to learn from a smaller country such as Laos. But times have changed and we have everything to learn from studying our neighbors in a world that will remain connected, no matter how much nostaliga people demonstrate for an archaic past of isolated nationalism. How people interpret history is their own personal decision. One can hold a grudge, and dream of revenge. 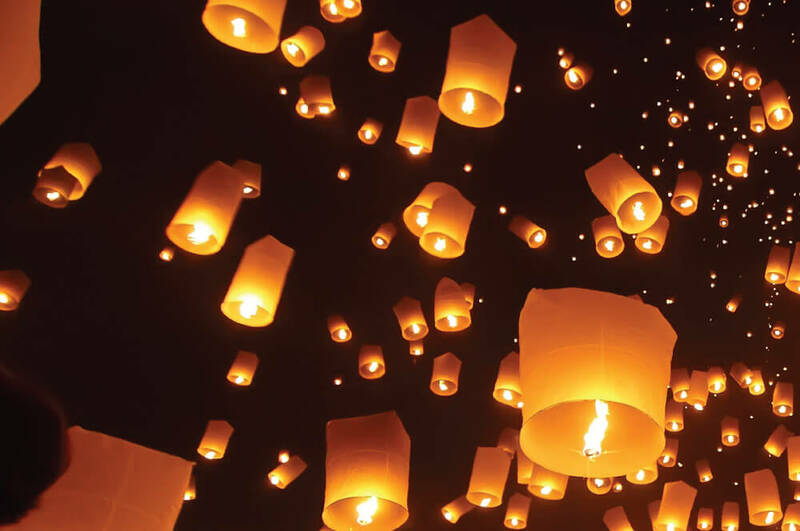 Or, as the Festival of Lights in Luang Prabang taught me, you can let go and soar into the sky.